For the first time ever in a UK city, the World's top 64 men and the leading 32 women will be competing for the title of World Champion at the same tournament. The organising consortium appear to be doing a great job in promoting the event. Manchester as a city has always done a good job of incorporating squash into the fabric of the city's sporting scene, and the World Open is being promoted as one of a number of large sporting events to take place there in 2008. 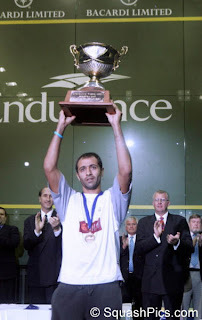 Egypt's Amr Shabana has been seeded to defend his World Title in the men's draw, and become only the fourth man after Jansher Khan, Jahangir Khan and Geoff Hunt to win the sport's Blue Riband event for a fourth occasion. "The World Open is the biggest tournament for any player and there’s a huge sense of anticipation around this year’s Championships. For me personally it will be extra special as it will be like playing in my own back garden. The National Squash Centre is just an hour from where I live and I'm extremely familiar with the court and the place. As an English player you couldn’t ask for any more and this will certainly be a highlight of my career." In the women's event, Malaysia's Nicol David has been seeded to win her third World Open title. David suffered a shock defeat to New Zealand's Shelley Kitchen in the second round last year, with the World crown eventually won by Australia's Rachael Grinham. 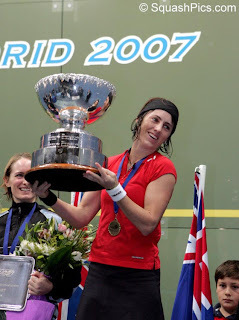 English interest will see Vicky Botwright contest the last big event of her career before retiring from the world tour; Tania Bailey, the world number 7, is the only notable absentee from the draw after being forced to miss out due to an ongoing troublesome knee injury which has plagued her for much of the season. A special 'season ticket' will offer die-hard fans the chance to watch all sessions throughout the week at a significant discount. Importantly for the sport's Olympic aspirations, Sir Craig Reedie - a British IOC committee member who lists squash as one of his own sporting interests on his page on the Olympic website - has been invited to attend, where he will join fellow IOC Member Tunku Imran. Squashblogger will be there on semi-final and finals days. Have you bought your ticket yet? They're selling fast and can be purchased here.